At a time when Americans are grappling with climate change, gun violence, voter suppression, and an immigration crisis, many economists — both conservative and progressive — would like to add to that plate of worries: a looming recession. After all, it’s been a decade since the US economy began to rebound from the severe financial downturn of 2008. Few economic expansions in US history have lasted longer than 10 years; most, on average, last about five. Most economists are not predicting a downturn as devastating as 2008, which was driven by lax and deceptive mortgage lending by financial institutions, and resulted in more than 3 million home foreclosures, and the loss of more than 8 million jobs. This time around, the recession trigger may be corporate debt, which is fueling a prosperity that is not reaching average Americans, progressive economists have charged. 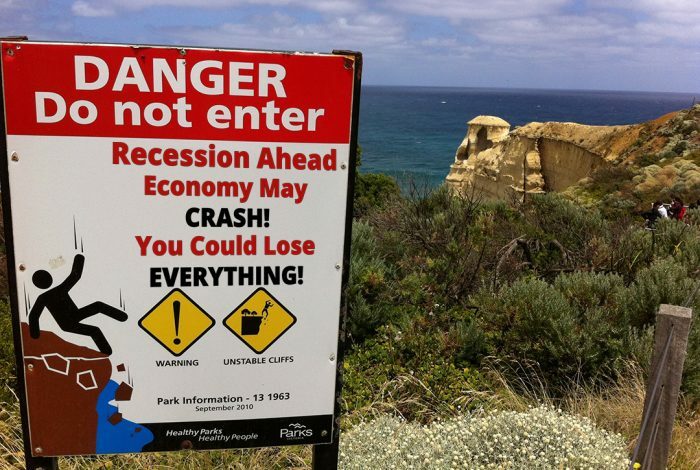 Making matters worse, they contend, many US families have not yet recovered from the financial meltdown of 2008. They noted that consumer debt, particularly when it comes to student and auto loans, has continued to rise. “What has this gangbusters growth done for us?” asked Marcus Stanley, policy director of nonprofit advocacy group Americans for Financial Reform (AFR). Since 1998, a “typical household’s” wealth has actually dropped by 8 percent, he said, while “financial sector profits as a share of the economy have soared 40 percent,” he added. Since 2000, worker wages have climbed by just 6 percent. Late last month, AFR released a sobering report, Finance for a Fair Economy, which documented how the US economy is not serving the public well. 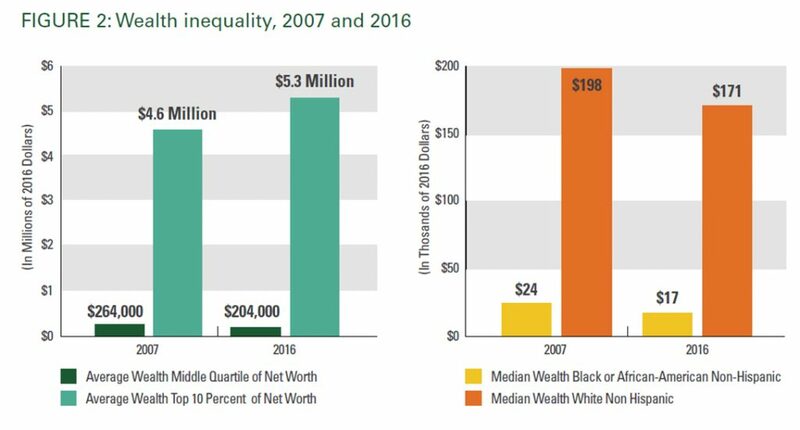 “The decade from 2007 to 2016 saw the largest increase in US wealth inequality on record,” the report asserted. During that period, the average wealth of 99 percent of US families declined by $4,500, mostly due to a loss in the value of their homes, the reported stated. In contrast, the top 1 percent increased its average wealth by $4.5 million. Speaking at a sparsely attended program on Capitol Hill March 28, Stanley and his fellow progressive experts urged policymakers to avoid the mistakes of the last recession. Their prescription had two prongs: 1) curb corporate behavior that could exacerbate the coming recession; and 2) when the next economic slowdown occurs, as is almost inevitable, ensure that federal help reaches average Americans. Even now, with a relatively healthy economy, corporate behavior imperils workers. Essentially, the economy is growing because corporations are borrowing a lot of money, but are not investing those billions in workers or technology, Stanley charged. Rather, Stanley said, they are buying back shares of their own stock (a practice that has only been legal since 1982) — reducing the number of shares available for purchase. That’s a boon to investors and to corporate CEOs, who prosper as the stock price shoots up. Hedge funds — investors looking to exploit vulnerable companies — also use debt to make deals that harm US workers, experts said. Katy Milani — a fellow at the Roosevelt Institute, a progressive think tank — said that the collapse of Toys R Us was a “great illustration” of debt’s harmful impacts. In 2005, the toy company, which had been publicly traded on the stock market, was sold to a group of private investors, who largely paid for the $6.6 billion purchase by borrowing billions of dollars — a move that saddled Toys R Us with a huge debt. Indeed, just paying the interest on its debt reportedly consumed nearly all of the business’s annual profits. After the leveraged buyout of the company, she said, things changed. “We didn’t know … what a leveraged buyout was back then, but we felt it, gradually.” Some jobs were cut, full-time workers were forced to work part time, and store maintenance was reduced. “All of us took on more work with less hours.” But the company still foundered. 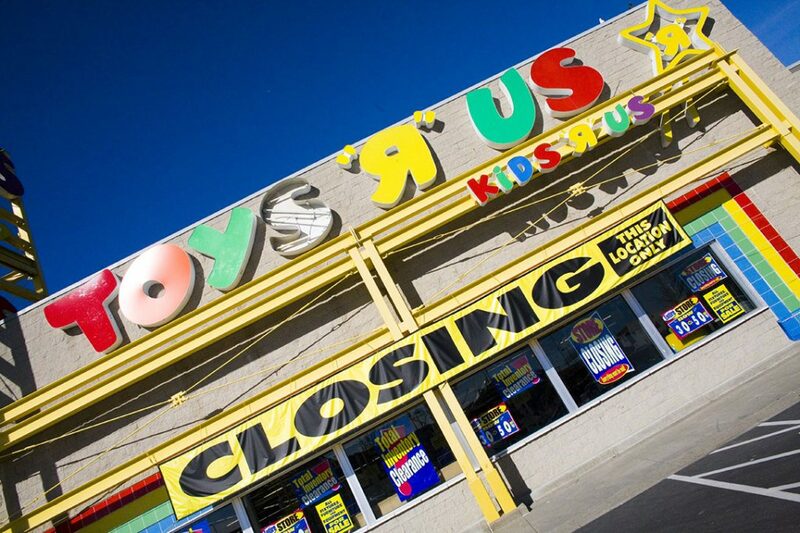 When Toys R Us filed for bankruptcy in 2017 and ultimately closed all its US stores the following year, “that was a dark time for me,” she said. “I’d given half my life to build up this company, and here I was, at the age of 58, unemployed and learning how to apply for a job after almost 30 years.” She lost her health insurance, and there wasn’t enough money to pay for both her new inhaler and her spouse’s diabetes medications. “I chose my husband’s medication over mine,” she said. Corporate debt has gotten out of hand, agrees Financial Times columnist Rana Foroohar, the author of Makers and Takers: How Wall Street Destroyed Main Street. While Congress enacted some new regulations to better police financial institutions after the 2008 meltdown, policymakers haven’t been paying attention to corporate behavior. “Companies took on debt, nearly $2 trillion in the last year or so,” she said. All the borrowing, she added, makes the economy more vulnerable. Corporations have increasingly raised funds by issuing bonds, “at record levels,” with “a lot of junk bonds ready to explode” should interest rates increase. “When the [Federal Reserve] moves rates, dicey debt goes bad,” she warned. Asked by WhoWhatWhy the specific steps Congress could take now to better prepare the economy for the next recession, experts offered a variety of proposals. Milani urged policymakers to “rein in corporate power and build up public power,” noting that the private sector has failed to serve the public when it comes to many areas of the economy, including access to health care and the cost of prescription drugs. She also suggested that workers should “have influence” on corporate boards. The Roosevelt Institute has strongly advocated for worker representation on corporate boards, as a way to ensure that companies consider more than the short-term advantage to shareholders and CEOs of rising stock prices. Stanley said there should be “limits on stock buybacks,” and also legal curbs on leveraged buyouts. Other recommendations were aimed at reducing income inequality, so that low- and middle-class families would have more resources to cope with a future downturn. 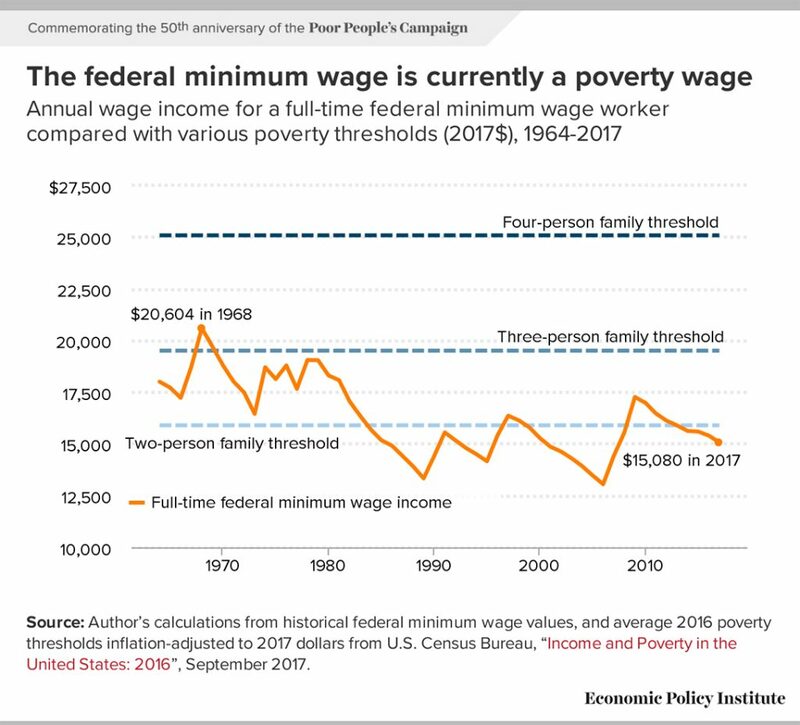 He also urged Congress to “raise the minimum wage.” EPI studies consistently have shown that the federal minimum wage has declined in value since 1968, contributing to higher poverty rates, particularly for minority workers. It’s also crucial that the federal government’s ability to help people recover is not stymied by a fear of government debt, Bivens said. During the last recession, Congress passed the American Reinvestment and Recovery Act, “which was a big thing and lasted 18 months,” Bivens said. The stimulus bill pumped about $800 billion in federal emergency spending and tax cuts into the economy. But in 2011, Congress approved the Budget Control Act, he said, which set limits on government spending. That law, he contended, “tamped down growth,” and postponed a rebound from the recession by years. But keynote speaker Sen. Jeff Merkley (D-OR) said the ultimate solution to the problem was far larger. “We will lose most of our fights” for economic reform without larger democratic reforms, he contended. He and Sen. Tom Udall (D-NM) recently co-sponsored the We the People Act, the companion to the House-passed For the People Act. The bill would address voter suppression, gerrymandering, “dark money” going to political campaigns, and secret political spending by corporations, Merkley said. Related front page panorama photo credit: Adapted by WhoWhatWhy from Jörg / Flickr (CC BY-NC 2.0).